The first half of 2015 brought news of high-profile public and private projects, and new state regulations for contractors. On May 18, a Los Angeles-based architecture and design firm released pictures and a scaled-down model of what a new San Diego Chargers stadium could look like at the current Qualcomm Stadium site. The proposed stadium would have 65,000 seats and up to 72,000 if it hosts a Super Bowl. It would be an open-roof facility, but with a canopy to provide shade and amplify crowd noise. The Citizens Stadium Advisory Group said $950 million would be spent on a stadium and $144,000 on a parking structure. California contractors are now required to register with the state’s Department of Industrial Relations and pay an annual fee of $300 if they want to work on public works projects. The provision comes from Senate Bill 854, which Gov. Jerry Brown had signed by June 20, 2014, and became effective March 1. The San Diego County Regional Airport Authority’s board of directors is considering four ideas to modernize San Diego International Airport. All proposals include rebuilding Terminal 1, building new leasing space for non-airline revenue opportunities, creating a new road to take traffic off Harbor Drive, and redeveloping the former Teledyne-Ryan property. Three of the four also propose rebuilding Terminal 2 East. The project is called the Airport Development Plan and is designed to meet demand through 2035. 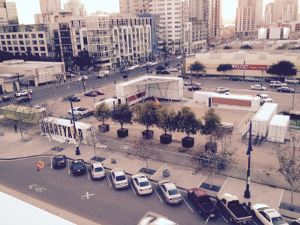 A group of architecture students transformed an empty parking lot at Park Boulevard and Market Street into a vibrant urban space: The Quartyard, with temporary food and beverage stands, and pop-up shops in 15 shipping containers that have been reconstructed to house businesses and storefronts. The city block was a parking lot that is zoned for an affordable housing complex, but there is no start date for construction because of a lack of funding and the elimination of state redevelopment funds. The students are graduates of the NewSchool of Architecture + Design, and operate under the name Rad Lab. They have a two-year lease on the property. Civic San Diego released details in mid-May on a proposed 4.1-acre park. East Village Green is designed as an open space aimed at providing an engaging and interactive place for residents, employees and visitors. Civic San Diego says the park will be constructed in phases over multiple years. Phase 1 -- planned to encompass the blocks bounded by 13th, 14th, F and G streets -- could begin construction in 2016 with an anticipated opening in 2018. Civic San Diego will seek community input to determine its features and amenities. Visit sddt.com/construction to access several industry databases, including the Construction BidBoard, Mechanic Liens, Notices of Completion and more.